How early is too early to start discussing Christmas? As most store owners will have ordered in their Christmas stock at the height of summer, hopefully the end of September won’t seem too offensive. The spirit of local High Street shopping is community focussed and often something of an antidote to the giants of retail that start the silly season before the last fireworks of Bonfire Night have fizzled out. As a result it isn't uncommon for indies to shun introducing Christmas to stores until as ‘late’ as 1st December. Whenever you choose to succumb to Christmas, if you haven’t yet started planning your festive windows and in-store displays then now is absolutely the time. Here’s a few ideas to get you started. Red and green is THE traditional Christmas combo, but there are a many more that signify the season just as effectively. Layers of whites, with perhaps a hint of sparkle, is perhaps the second most common sort of snowy Christmas colour scheme. Gold or silver are obvious contenders too. Orange would be an unusual choice that could work well, being evocative of clove stuffed orange pomanders, or indeed the real thing. Navy blue and white is a smart combination that is reminiscent of a clear, wintery, starry night sky. Luxurious purple with gold is decadent, slightly frivolous and richly festive. For a contemporary and fun feel, try a variation on the traditional red and green theme by using hot pink and turquoise with white. Sometimes more is more, sometimes less is more, but half way in between will always look half-hearted. So whether you choose to go minimal with a graphic, simple design or maximal with a jam-packed window, make sure you really go for it to get the most impact from your visual statement. 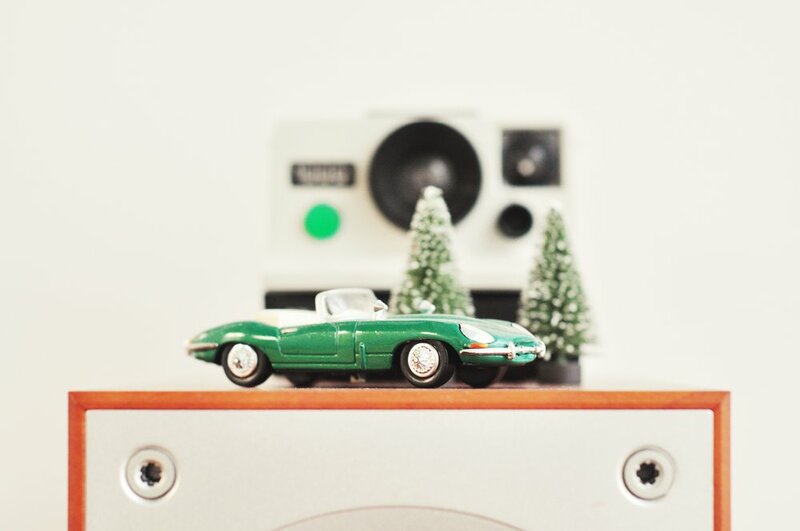 To keep on top of your VM budget, you could raid the loft for vintage decorations and toy collections, that might have been forgotten about, to make a unique and delightfully nostalgic display. Another advantage of reusing like this is avoiding buying new decorations, which are not always produced in the most long-lasting or environmentally friendly way. If you already have a go-to stash of Christmas display goodies, you can certainly reuse them each year (or every other on rotation to avoid repetition) but by pairing with something different, borrowed or new you can make make fresh schemes each time. Even with the most careful handling, tinsel doesn't often last well for repeated use. Made from plastic nowadays, unless it can be reused multiple times it is an environmental no-no. Every bit as bad as that, it is also the laziest most obvious way to say Christmas in a store. But life is too short to go without a little sparkle altogether, so consider other ways to introduce shimmer and shine. Biodegradable glitter, confetti and sequins all now exist to make the world a better place. Shiny metal cookie cutters in star or tree shapes and so on are also brilliant, inexpensive and reusable. Real life greenery is utterly charming, authentically traditional and can be used in endless ways to make a display. Fill a window with fronds, use branches to make a dress for a mannequin, suspend branches and dangle decorations or products from it, hang a selection of leaves with different coloured ribbons, the choice is yours. Biodegradable to boot, you won’t have a guilty conscience, and you’ll certainly turn heads. Making life easy for shoppers is one of the most effective ways to encourage sales. Shelves or hooks on walls are one of the easiest ways to display products, so take advantage of the verticals in your store with these pointers. Most shoppers will not often bother to look up to the higher shelves, unless they are really searching hard for a product (although ideally you don't want them to have to do this, by making everything clear), or the items displayed up high are truly eye catching. As these shelves are difficult for many shoppers to reach, they will of course be shopped from less often. So the Visual Merchandising convention is to place premium products with higher margins up here. This way, when products do sell from the top, they earn and pay for space on the shelf, even if they sit there for a longer time. Common sense dictates that heavy or breakable items should not be displayed up high, as they will be more likely to cause injury if an overstretched arm reaches up and knocks something off or loses grip. The last thing you want is bulky objects falling on to customers from height. From an aesthetic point of view, visually heavy or dark coloured items are less successfully displayed up high, because they can make shelves look top heavy. Shelves are more appealing to look at when dressed with dark and bulky items at the bottom, gradually getting lighter as the shelves go up. Eye Level is Buy Level, or so the saying goes. This is one of the most basic principles of Visual Merchandising. As this area is easiest for adult shoppers to browse, it will receive significantly more attention from shoppers than product in the other zones. If you have an abundance of a product you want to shift, or a line or collection you want to showcase, this is the ideal spot for it. It isn’t rocket science to say that products placed in this area will be most easily seen and desired by children. If your business doesn't sell anything for little youngsters, then use these lower shelves for items in the next margin bracket down from this in the eye level zone. Products with detailed instructions or particulars on the packaging can be well placed here, as it is easy for customers to pick them up to scrutinise. Bending down to pick up items placed near the floor can be a pain for some groups of shoppers, particularly the elderly or those with certain disabilities. Generally, products with lower margins are best placed on these lower shelves, so that bestsellers and merchandise with better margins are given the premium eye level position. It is also worth mentioning that less mobile customers and wheelchair users may often need a little extra help from store assistants, no matter how conveniently things are placed on shelves. So its always worth encouraging staff to be sensitive to their needs and quick to step in to offer good service. You can have the most beautiful shop display in the world but it is nothing without the support of staff to make it shoppable and accessible to all. Developing a Corporate Social Responsibility plan might seem like a tall order for many independent retailers. But CSR is not just for the big boys in business, and can help even the smallest of businesses become more environmentally and financially sustainable. Visual Merchandising is the perfect area of business for retailers of all sizes to start streamlining, because displays are rarely used twice. Creating new props, set pieces and baffles from plastic or foamex every season is becoming increasingly irresponsible, and is certainly not cost-effective for smaller stores. Committing to reducing the use of disposable plastic is just one step that all businesses should now be taking to reduce their carbon footprint. Fortunately there are plenty of sustainable alternatives to plastic for making impressive window spectacles. Paper is the single most virtuous of materials for making window displays. The ultimate renewable resource, paper is incredibly versatile and available in myriad different textures, patterns and finishes. You can paint it. You can punch holes in it. From the simplest bunting to complex origami, the possibilities for design with paper are literally endless. Paper can also be very cheap or even free to source. Reusing and repurposing old magazines, newspapers, maps, music sheets and so on will always win extra ‘green’ points, as will using recycled paper. These types of paper will not suit every brand or window story of course, so the next best place to find paper is your local scrap store. They may have larger scale off cuts or end of line rolls of different papers for you to fashion into decorative displays without leaving a big environmental footprint. The easiest way to use paper to make a design statement is to cut out simple shapes from a template and suspend them in the windows, ideally using clear nylon thread. Inaccurately or roughly cut shapes will instantly look unprofessional of course, so take care or delegate to someone with patience. With this kind of display more is usually more, so make plenty. To tap into the sculptural potential of paper you can experiment with folding, fringing, curving and curling - simply run the edge or a ruler or scissor blade along a strip of paper like a florist curling ribbon. Secure shapes with staples, staple pliers, double sided tape, sticky pads, or glue. Play with light and shadow by punching or cutting holes or other shapes to the paper, adding a further layer or detail to your display. Construct larger shapes or even set pieces using boxes or rolled-up wadges of corrugated card (sourced from your own empty delivery boxes of course). Cover with paper maché which is, in case it has been a long time since you did this at primary school, simply a mixture of paper and glue that applied to cardboard shapes to make a hard surface. You can texture it too by adding sand, rice, lentils or textiles depending on what you are trying to achieve. For a smoother finish, layer it up neatly, and lacquer it with water-based acrylic varnish for a glossy effect. If you still need convincing that paper is better for your windows than plastic there is plenty of inspiration to be found on my Pinterest Board. Showcasing your actual product stock in your shop windows is the most cost-effective way to create a window display. It signals unambiguously and efficiently to customers exactly what can be found in store, but not all retailers are blessed with selling pretty products that easily make great window displays. This makes visual merchandising much more tricky for purveyors of the more humdrum, everyday essentials that are unremarkable, or even ugly, to look at. The last thing you want to do as a small business is go to the trouble of making a banal window display that is easily overlooked or, conversely, spend a lot of money on specially made props and set pieces to compensate for the unattractiveness of the products. Luckily, with a little creativity and imagination there are several ways to make a resourceful and striking display, even with using the most dull items. It can be tempting to show off everything you sell in the window, particularly if you stock many and varied product lines, but this usually leads to a messy melange. Less is usually more when selecting product varieties for a display, to keep the message clear, concise and give it a curated look. If you think of a window display as a theatre stage, ordinarily there would be one star of the show, and a supporting cast. So use this metaphor to help you choose one product to be the focal point of your shop’s show. Give this one pride of place, centre stage. The leading role is nothing without the help of his or her supporting actors, so pick another two products (maximum) to make up the rest of the cast. Display these around the main character, making sure the emphasis is on the star. Another visual merchandising technique that has great impact is repetition. Although an under used device in window displays, repetition can be very effective at attracting attention. Andy Warhol’s Campbell Soup Tins are a great Pop Art example of this. It is worth emulating and very easy to achieve whether you sell soup, scissors, spanners or shoes. Simply choose one product and display duplicates of it, adding nothing else to avoid diluting the potency of the image. If the same product is available in different colour variations then creating a kaleidoscopic rainbow effect is just as good as using one colour throughout. Another variation on this technique is to use all one colour except for just one box or item in a different colour. There are multiple ways to install the products from suspending on string or clear thread, or stacking up to placing on shelves or plinths. The best and easiest display method may depend on the type of product you choose, and whether you keep it boxed or unboxed. Every month or 6 weeks you can simply choose another item to repeat throughout the window, and hopefully get people wondering about what you will choose to show next time. The third way to make a virtue of ugly product displays is to set a scene and tell a story, because this is what really gets people talking. If you can make people laugh, you are definitely on to a winner. For example, a store selling household products could stack up packets of toilet paper rolls, and unwrap and unroll a quantity of the rolls to make a deliberate, carefully placed mess - as if the dog or kids have created chaos then disappeared. A witty caption could be written on to the window, or a series of doggy footprints on the floor. This would be enough to help explain the scene and hint at the story, as opposed to just leaving a pile of unexplained loo roll everywhere. This sort of humorous ‘whodunnit’ style tableaux can also work with a pyramid stack of tins or boxes that has been partially knocked over by a mystery pet / child / elf / etc that has disappeared leaving just a clue to their guilt. Simply change the stacked items and the clumsy character to change the story. Pyramid stacks are not overly practical in small shops for obvious safety reasons, and have long been the source of calamity jokes on TV adverts. However, there is no harm in referencing this in window displays, particularly where customers can’t reach them to get hurt or damage your stock. You may well think of better stories and ideas that are more appropriate to your particular brand. If cashflow does not permit getting a freelance Visual Merchandiser onboard, you can always get your staff involved with brainstorming and installing the ideas, which will have the added bonus of making them feel valued provided you reward their contributions. Some stores will be more affected than others by the damage caused by strong sunlight, depending on which side of the street they are located, the direction of the road and the surrounding buildings. But it is worth being alert to this easily avoided problem, especially as it costs nothing. Faded posters and notices quickly make stores look old and neglected. This is no good in the fast paced retail industry where everything needs to constantly look up to date and fresh. Any product displayed in the windows will also be vulnerable to sun damage, so be sure to keep an eye, and rotate displays more frequently if necessary. Even if you markdown ex-display products it will be difficult to sell them at all if they have been baking in the sunlight for too long. Avoid cladding the windows in yellow cellophane at all costs, as it is incredibly dated and obscures the view in to your treasures. Instead, consider delegating to shop assistants a weekly check for any items that need removing or replacing. People buy from people, it’s true, but personal clutter on and around the service counter of a shop diminishes professionalism, and can detract from the brand image. The charm of independent stores is that they are unique, so of course it is very important to inject plenty of character into retail premises. However; the place where transactions are carried out should be free from family photos, novelty pens, toys or other personal knick-knacks. It can be difficult to get the balance right between personality and the personal, but generally speaking it is best to avoid resembling cluttered desk booths that have been made cosy by open plan office staff. It can seem over-familiar. The emphasis should be not on you, but on your customer. Although blu tack is a quick and easy way to fix important notices to glass door panes and windows, it is by no means the most attractive option. It can very easily look messy, amateurish and as though no effort has been made to keep a presentable front. Professionally produced window stickers may seem hard to justify when cashflow is slow, or if only a temporary message is required, so a better solution to blu-tack or sellotape is transparent sticky glue dots. Available in permanent or repositionable strength, they are made by Bostik, Pritt and Scotch among others so inexpensive and easy to source. Being clear they won’t clash with any brand colours, and will create a more sophisticated finish than your neighbours still using those ugly blue blobs. Unless you happen to be a keen calligrapher, avoid hand writing notices, as all-too-often they look horribly unprofessional. When you have a quick message write or one-day special offer to promote it can seem like a chore to print out a half-decent sign from the computer. It would be a waste of money to have these professionally printed, and of course hand written signs do have character and charm. However; unless written by someone with truly beautiful handwriting and using a good choice of pen and paper, it is a wasted effort. Scratchy biros and nearly-dead marker pens are not a good look, but if embracing the handwritten would suit your brand then here are some tips to help you succeed. Chalk written messages on blackboards are currently very in vogue, but are also classic so will always look stylish. Available in any size, chalkboards have a place inside and out. The right typography can change the tone of the message to match your brand image. Even the least artistic person can make a beautiful sign by printing out the words needed in the right size to make a template. Cover the back of the paper in chalk, then tape it in position on the board. Draw over the words with a soft tipped pencil to make a transfer of the letters, then remove the paper and fill in the text on the board with map chalk or a chalk pen. If that’s too much bother, delegate it to one of the team, and if chalk doesn’t fit the store image, download and install some suitable free stock fonts from the web to use in making your own DIY printed paper signs. Use the same typefaces to unify your logo, storefront signage, POS graphics and pricing to create a professional, cohesive look. It will be worth the effort. Spring is great time for maintenance around the home, and shops are no exception. Even if your regular cleaner is committed and conscientious, your shop will love you back after a really deep clean and a thorough maintenance inspection. Go over every square inch with a fine tooth comb looking for wear and tear, and make a list of any dirty, dusty corners, grubby shelves or cabinets, broken light bulbs, out of date info notices, prices, offers, ads etc. Delegate this task if you are too busy, and ensure everything on the list is actioned. It is amazing what grime you can notice when browsing a store as a shopper; details that people who spend everyday in-store would easily miss. Residue from sticky pads, double sided tape and sky hooks is ugly and always makes stores look particularly unloved, so invest in a bottle of Sticky Stuff Remover, and get rid of all trace as part of your Spring Clean regime. Successful Visual Merchandising can be difficult for independent retailers to achieve on top of the day-to-day pressures of running a business. Firstly there’s the need to constantly come up with new and exciting ideas, and then there’s the time required to actually implement them – as well as finding the cash to pay for the project, of course. It may seem like a real drag to come up with display after display but, in today’s environment of internet shopping and giant retail chains, it is has never been more important forindependents to invest in the appearance and customer experience of their stores. The good news is that although Visual Merchandising is a profession in its own right, you don’t have to be qualified or an expert to succeed in creating competent displays. Once the January sales are over and all trace of the busy Christmas period gone, it is the perfect time to focus on creating a Visual Merchandising Strategy for the whole year ahead. First you’ll need to decide which festivals and celebrations you intend to coincide your displays and promotions with. 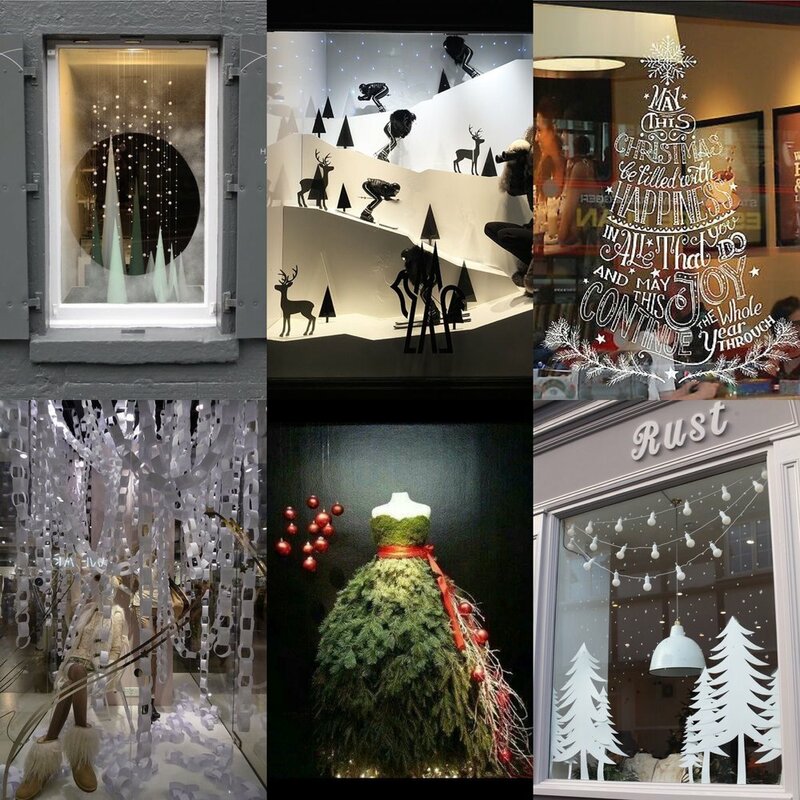 Window Displays are for life not just for Christmas! There are so many events throughout the year that it would be unrealistic to reference all of them, but to aim for a minimum of 8 wow-factor window displays per year is good practice. The main celebrations (in addition to the four seasons) are New Year, Valentine’s Day, Shrove Tuesday / Mardi Gras, Mothering Sunday, Easter, May Day, Harvest, Halloween, Guy Fawkes Day, Remembrance Day and, of course, Advent and Christmas. In addition, there may be sporting events, different religious observances, regional Saints’ Days or other occasions such as International Women’s Day, Yarn Bombing Day or even International Talk Like a Pirate Day, that chime with your brand and customers. Film releases and news stories can also be a rich source of inspiration, and will speak to your audience. However it is wise to avoid referencing the more political aspects of current affairs – and always ensure that any stories or events you latch on to are relevant to your core business. Once you have chosen your window display occasions, you can set about planning for them. All too often Christmas window displays are left unchanged until the middle of January, at least a week after most customers have already recycled their tree into wood chippings. The superstitious would say this is bad luck, but old wives’ tales aside, it is easy to see how this could harm a shop’s image. Retail is indeed a fast-paced industry, but with just a little forward planning it is possible to keep up. Setting dates in the shop diary for window-display Change Days is an excellent way to ensure your shop is always current. Designating fixed dates for these overhauls signals to everyone working in the shop that this is an important activity that must be done on time. However; fixing dates just for new installations is not enough. Time forpreparation, planning and manufacture of displays must also be accounted for, as must the removal and disposal or storage of previous displays. So it is advisable to always be working around three months ahead so that things don’t get squeezed too close the deadline and either rushed at the last minute or dropped completely. Being organised takes the pressure off, and gives the chance to make things fun. For example, Twelfth Night could be a good time for a staff do (particularly if the Christmas period was too intense to arrange a party), during which you collectively and therefore quickly strip out all trace of Christmas, before heading out for a reward meal. Knowing how many different display themes and ideas you will need to come up with is very useful, whether you plan to delegate displays to a freelance Visual Merchandiser or do it all yourself in-house. Keeping a spreadsheet or other type of ideas list means you can add new ideas as and when they come up, and track old or previously used ones so that annual displays don’t become repetitive. This also encourages and enables you to plan and prepare in advance, so you can be ready for an efficient installation, with minimal disruption to the shop floor. Generating ideas comes easily to some people, but others find it difficult to be imaginative. If there is a budget available, bringing in a freelance Visual Merchandiser to help generate ideas would be ideal – and of course they would also be able to implement them on your behalf. However, if cashflow dictates a DIY solution, consider calling a staff meeting for a communal brainstorm. Design by committee is not usually a good idea, but it will certainly elicit some initial inspiration from which you can then develop the better suggestions. Perhaps running a competition for the best display idea among your staff would be worthwhile, and would have the added bonus of making them feel valued. Of course it isn’t possible to plan for every detail and the exact number of boxes that will be getting in the way at any one time. But a little advance anticipation will help you stay on top of the disruption, and make your Visual Merchandising duties a little more joyful. Lighting is one of the most important elements of retail store design and can have a substantial impact on sales. You can create beautiful product displays, but if they aren’t lit properly, all that work goes to waste. Balancing the practicalities of displaying your merchandise with atmosphere and dramatic impact can be a challenge, so here are some of the basics of retail lighting design. Lighting is likely to be one of your biggest investments in terms of store design. It’s estimated that 43% of your energy costs are likely to go on lighting, and that’s after your initial investment in any kind of lighting rig. But scrimp on this design element and you could be compromising sales if merchandise isn’t displayed to best advantage. Choosing the level of ambient light – the general light in the store – is crucial. Compare a brightly lit a pound shop or branch of Primark to the warm, welcoming low light of a luxury boutique and it’s clear how different light levels send different brand messages. Brighter isn’t always better, and low light can indicate a premium brand, but it’s crucial to balance this with merchandise display. If you have low ambient light levels, how will you light displays to keep the focus on your product? Task lighting highlights areas of the shop that perform functions – cash desks, changing rooms, help desks. It helps customers orientate themselves in store and lights the area so that particular task can be performed effectively. Decorative lighting is additional lighting that creates a particular atmosphere in store. It might add to the ambient light, but its main function is visual impact. Accent lighting is used in conjunction with ambient lighting to highlight displays. The fittings required will depend on your merchandise. Mannequin displays will require a wider beam to highlight than a display of jewellery. In this Diesel store, low ambient light, accent lighting and decorative lighting are combined to create a treasure-trove feel to this display. Retailers are increasingly incorporating natural light into their visual merchandising. Department stores like Macy’s that traditionally covered windows entirely with displays are opening them up again to bring in light from outside. Natural light makes shoppers feel good and displays merchandise colour accurately. Consider how you moderate natural light to deal with very sunny or overcast days and how you’ll light the store at night. One option is to use a thin curtain material that lets through light but cuts out bright sunshine. You can also balance out natural light with lamps to even the overall effect and avoid silhouettes. Some lighting systems offer sensors that will adjust lamps as the light level outside changes. Natural light is used to bring out the contrast of natural tones and bold colours in this display at the Revival store in Chattanooga, USA. Lamps have individual colour tones that give different effects in an overall lighting scheme. The Colour Rating Index (CRI) of a lamp measures its ability to display colours accurately compared to natural light; the lower the rating, the more accurately colours are displayed. A low CRI would be appropriate to changing rooms where customers want to view a garment as it will appear outside the store. Ideally, your lighting system should be flexible so that you can redirect lights depending on your displays. A track system with adjustable lamps allows you to combine flood fittings that give an ambient light to the whole store with spot fittings for highlighting particular areas. Track systems are a substantial investment, but at the very least you should ensure you have the ability to highlight key displays and attractive merchandise separately from the ambient light. We’ve covered using windows for natural light, but you can also bounce around more light with mirrors and reflective surfaces. Your colour scheme will also have an impact on how your lighting design works. This is a guest post courtesy of Modern Retail. Visual Merchandising is not only about making everything pretty. It is also about the nuts and bolts of how a store functions and optimising that for the best possible customer experience. A fundamental part of the VM process is to create a good store layout. Using a combination of wall and freestanding display fixtures is ideal, but remember to check whether wheelchair users and customers with buggies can easily pass along aisles or around corners of fixtures. It will induce fury if they can’t! Space is at a premium, particularly for indie-shops, but failure to enable access for these customers can be damaging to business. Despite my best efforts to support my local high street, even I have on occasion given up when shopping with a buggy becomes too frustrating. An awkward layout is a surefire way to send customers straight to the supermarket or internet. As Mums are generally frequent, regular shoppers, they are among some of the biggest spenders, so make their shopping experience as easy as possible to encourage them to return again and again. Even when the layout is optimal, boxes of stock waiting to be displayed can cause a real problem, both in terms of physical space they occupy and also the visual mess. To make the process smoother and less disruptive to customers using the store, when you receive a big delivery consider bringing in an extra pair of hands for a half or full day, to get those boxes out of the way and out of sight as quickly as possible. Communicate with your neighbouring shops- perhaps there is a freelance that could be booked to help out for a few hours in each store on the same day, to keep it cost effective? Placement of the till or service desk is an interesting conundrum. All stores are different, and people traffic will flow in different ways according to every unique layout, so there is no one perfect place. But here are a few pointers…. Bear in mind that when positioned against the front window, although it might seem space saving, all those ugly tech cables, bags and any other under-counter clutter are on display - right in the main free advertising platform! If this is really the only position the service counter can be, think about how you might make a virtue of its awkward placement. Can the staff wear uniforms with eye-catching logos or messages on their backs? Would making a kind of theatre of the service suit the brand, by making the staff part of the show? Can the counter be made to look truly attractive, and perhaps part of the window display? Think outside the box.... Otherwise, try a different arrangement, and keep it for a good few weeks to evaluate how successful it is. Change is good! As long as customers are not inconvenienced by the store being in flux, changes will make it seem like something is happening, and create a buzz, a talking point... which is always the end goal. Before you start rearranging things, plan it out on paper. It doesn't have to be a brilliant drawing by any means, but if you want to be sure about fitting in everything with a different configuration, investing in a scale ruler and a set square won't cost much and is a very easy way to get an accurate picture. What layout changes could you make to improve your store this week? Share your before and after snaps on twitter and tag @zoehewettdesign or @zoehewettinteriors on Instagram. Like it? There's more where that came from! Subscribe here and never miss a post.